I saw this dish on an episode of Iron Chef America and had to try it. It's a pairing I would not have thought to do, so while the idea is still fresh in my mind, I thought I should give it a go. Unfortunately, I only saw the finished product on the show, not really paying attention while it was being made. One of my habits is having the tv on in the kitchen while I work as background noise. I'm sure I missed some integral parts to the cooking of it, but I shall experiment with it anyway. I took one whole rack of lamb, deboned it, and trimmed it of excess fat. I placed that into a marinade of balsamic vinegar, honey, olive oil and shallots for several hours. To make life easier, I purchased two raw lobster tails. In the show, the lobster and lamb were skewered together. Since I wasn't paying attention, I'm not sure if they were cooked together on the skewer, or cooked then skewered. I would think cooking together on the skewer would result in uneven cooking. So, I opted for no skewer at all and instead, grilling them separately in their whole, which my master griller Chris did for me. The lobster went on the grill with simply salt, pepper and melted butter. Fire roast the Jalapeno over an open flame. 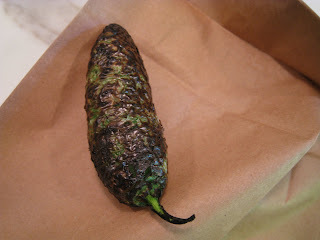 I just used my stove burner and charred the skin, then placed it in a paper bag to steam, and then removed the blackened skin. Depending on how spicy you like you sauce, use no seeds, some seeds or all of the seeds in your sauce. I used no seeds. Put the peas, jalapeno, mint, water and vinegar into a blender and puree to liquify. Then add the grape seed oil and blend until just incorporated. Salt and pepper to your taste.